Hub New Music performed "Soundscapes: The Music of Andrew Norman" at the Museum of Fine Arts Boston, as part of their Sound Bites concert series. As an undergraduate, Andrew Norman nearly gave up composing to go into architecture. Happily for the music world, he realized that his love of buildings could be incorporated into his works. “In a way, I started writing music about buildings,” Norman said in a 2014 interview. 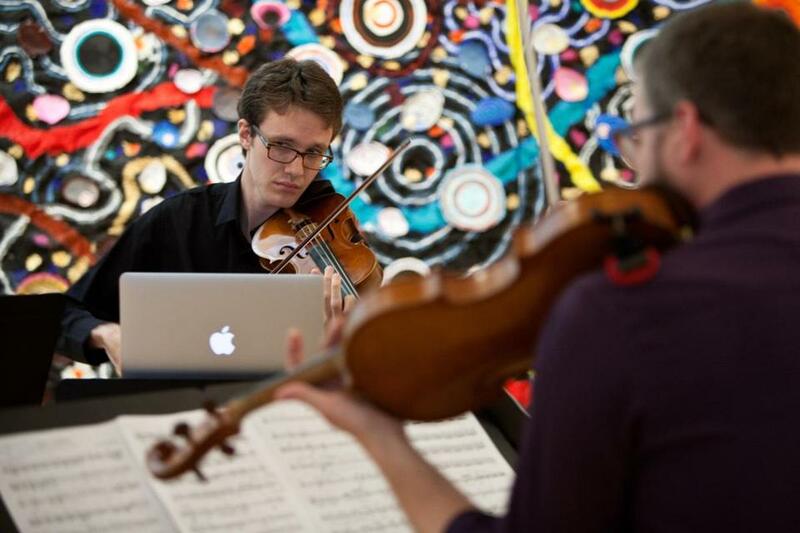 The interplay between them was the subject of a Thursday evening concert by Hub New Music (formerly the Boston Young Composers Ensemble), part of the Museum of Fine Arts’s inventive Sound Bites series. By presenting three architecture-centric works in chronological order, the program offered a quick resume of Norman’s entirely original synthesis of the two fields. The energetic “Light Screens” (2002), for flute and string trio, takes its title from the stained glass window designs of Frank Lloyd Wright. Their use of basic shapes and asymmetric patterns were captured, almost too exactly, in Norman’s motoric lines and jittery, halting rhythms. In still moments one imagined the architect contemplating a hard angle or deep color. “Garden of Follies” (2006), for saxophone and piano, goes the opposite way. The extravagant yet functionless creations alluded to in the title were submerged in angular music that mostly kept the two instruments on separate planes. Occasionally there was a quizzical dialogue and, in the last of the five short pieces, a beguiling nocturne. It’s in “The Companion Guide to Rome” (2010) for string trio, a 2012 Pulitzer finalist, that Norman makes the connection between sound and place his own. The links are neither literal nor dissociative: Norman takes nine churches from Rome — where he lived for a year — and transmogrifies the sense of their spaces to create full-blooded character pieces, each with its own sound world. The connections are wonderfully elusive. Is the graceful, interlocking dance in “Pietro” a nod to the structural symmetries of San Pietro in Vincoli? Maybe the composer found himself haunted by the Basilica San Clemente, hence that section’s ghostly whistles and high harmonics. In the long final movement, “Sabina,” there is lavish, static, major-key harmony, while the timbre veers repeatedly toward noise — a reminder, perhaps, that even within the most impassive edifice, emptiness and impermanence lurk. The performance, by violinist Lilit Hartunian, violist Samuel Kelder, and cellist Jonathan Butler, was dynamic and committed. The concert took place in a corner of the Linde Family Wing for Contemporary Art. The audience was a mix of Boston’s young new-music faithful and museum visitors who’d happened to wander by. It’s doubtful that the latter would’ve found their way to a quieter, more secluded place, so even though the music often had to compete with the noise of a nearby café, the site’s openness made it worth the occasional irritation.